The Hague, 16 February 2015 – The campaign group Naame Shaam (1) today called on the US and its allies to take concrete steps to stop the ongoing massacres in Syria and to refer the situation in the country to the International Criminal Court (ICC). Those responsible for war crimes and crimes against humanity committed in Syria should be held responsible, including Syrian, Iranian and Lebanese political and military commanders. For the past two weeks, the Syrian air force has been heavily bombing the suburb of Douma, near Damascus, using barrel bombs and other indiscriminate weapons and killing and injuring hundreds of civilians. In recent weeks, Iranian and Hezbollah forces have also launched a major military operation against the Free Syrian Army in Daraa and the southern parts of Syria bordering Israel. Media reports claim the operation is led by the head of Sepah Qods Gen. Qassen Soleimani himself. Sepah Qods is the foreign arm of Sepah Pasdaran. 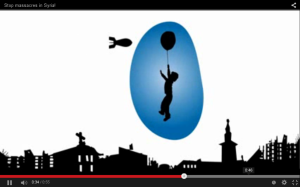 Naame Shaam today released an animation video clip (3) inspired by the work of renowned graffiti artist Banksy. The clip links Iran’s Supreme Leader Ayatollah Khamenei and General Soleimani to the massacres in Syria. The video implies that, unless these two are stopped, the massacres in Syria will continue. The report also presents a legal case for treating the war in Syria as an international armed conflict that involves a foreign occupation by the Iranian regime and its militias and a liberation struggle by Syrian people against this foreign occupation, as defined by the 1907 Hague Regulations and the Fourth Geneva Convention of 1949. 1. Naame Shaam is a group of Iranian, Syrian and Lebanese activists and citizen-journalists that focuses on uncovering the role of the Iranian regime in Syria, www.naameshaam.org. Naame Shaam is supported by the Netherlands-based Rule of Law Foundation, www.lawrules.org. 2. For more details about Iranian weapons used in Syria, see here. About the Iranian role in the manufacturing of barrels bombs in Syria, see here. 3. The animation video clip ‘Stop massacres in Syria’ can be found here. The Iranian Revolutionary Guards are in control of all major military operations in regime-held areas in Syria. They control the Syrian military and other Syrian paramilitary forces such as the National Defense Forces known as the “Shabbiha.” In May 2014, Sepah Pasdaran commander Brig. Gen. Hossein Hamedani said: “Bashar al-Assad is fighting this war [in Syria] as our deputy”. Regime-held areas in Syria are effectively occupied by Iran. The chief of Iran’s Sepah Qods force, General Qassem Soleimani, is the de facto ruler of Iranian-occupied Syria. Sepah Qods is the foreign arm of Sepah Pasdaran. The Iranian regime is complicit in war crimes and crimes against humanity committed in Syria. There is sufficient evidence to open investigations and bring law suits against the Iranian political and military leadership for its role in many of these crimes, including the Ghouta chemical attack in August 2013 and the use of barrel bombs against civilians. The primary objective behind Iran’s war in Syria is to keep arms shipments flowing to Hezbollah in Lebanon via Syria, so that this militia remains a strong deterrent against any possible attack against Iran’s military nuclear programme. The arms shipments are today totally dependent on vulnerable land routes passing through Syria.